First WOMAD 2018 Artist Announcement! AMADOU & MARIAM, CAMILLE, DJANGO DJANGO, SHARON SHANNON, LA DAME BLANCHE and loads more included in our first artist announcement! Watch our video featuring Peter Gabriel and our festival programmer, Paula, talking about WOMAD 2018 and introducing their top tips for this year here. 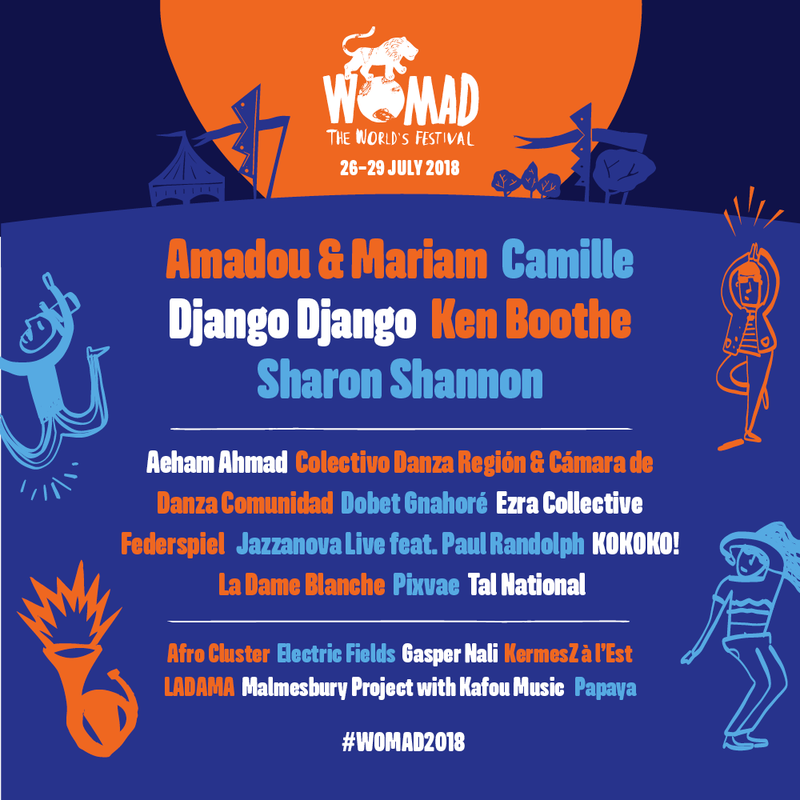 Now in its thirty-sixth year, WOMAD features a colourful medley of music, dance, food, art, spoken-word, poetry, science and other family fun, bringing together artists and fans from all over the world. After a record-breaking 2017, this year’s festival weekend is set to be one of the most spectacular to date, with an incredible and diverse line-up from around the globe, the first wave of which is announced today. Amadou & Mariam are one of the most prolific and thrilling acts to come out of Mali over the last two decades. The couple made a name for themselves with their irresistible swinging Malian blues before venturing into soul and have since collaborated with the likes of Manu Chao and Santigold in the process, while French artist Camille’s diverse artistic career spans from performing Benjamin Britten, to providing the soundtrack for Pixar’s Ratatouille, to reinterpreting Joni Mitchell songs. Django Django are arguably the most inventive art-rockers around, and their pop-edged psychedelia proved as fresh and dynamic as ever on last month’s critically acclaimed new release Marble Skies. Sharon Shannon, the Irish accordion master has ploughed her own very distinctive furrow but is always eager to explore new styles from around the world as her latest album Sacred Earth takes on an African vibe. It was co-produced by WOMAD veteran and African music expert Justin Adams. With her explosive mix of hip hop, cumbia, dancehall and reggae, the Cuban singer, flautist and percussionistYaite Ramos Rodriguez, aka LA DAME BLANCHE will, this year, make her WOMAD UK debut delivering her powerful, compelling and extraordinary sound fusion. Born in Havana, she grew up in the heart of an awe inspiring musical cauldron that included her father, Jesus “Aguaje” Ramos; an exceptional trombonist and the artistic director of the Orquesta Buena Vista Social Club. Amongst those kicking off the festival on the Thursday night will be the Jamaican reggae musical titan Ken Boothe, whose mellifluous voice topped the UK charts in the 70’s with Everything I Own and who was, of course, namechecked by The Clash on (White Man) In Hammersmith Palais. He will be joined by celebrated nu-jazz collective from Berlin, Jazzanova Live featuring Paul Randolph, whose impeccable Latin-tinged sound has led to collaborations with Gilles Peterson and remix commissions for MJ Cole, 4Hero, and Fat Freddy’s Drop. A brilliant fusion of the deepest Afrobeat and the sharpest hip-hop. Innovative dance company exploring the rhythms and traditions of the Afr-Colombian underground. Where 21st-century soul, electronica, and Australian indigenous traditions meet. Tremendously lithe outfit upholding the West African big band tradition. WOMAD is about so much more than incredible music; as well as these brilliant artists (with many more to come), it also boasts a cornucopia of activity; live literary events and conversation at the World of Words; mind-expanding talks, experiments and performance at the Physics Pavilion; pampering and relaxation at the World of Wellbeing and WOMAD Spa; an exclusive installation in the World of Art; fantastical activities and interactive workshops in the World of Children; and the only stage in the world where instead of performing the artists cook for the audience: the legendary Taste the World. More artists for WOMAD UK 2018 will be announced soon, alongside further details of exciting partnerships withBBC Radio 3 and Ecotricity.